1. Do you write full time? If not, how do you make a living? I am not working at all for the time being as I have opted to stay and look after my children. My eldest is seven and my youngest just turned four and is due to start full-time education in September. As much as I would love to be a full time writer, with funds being limited, I will be looking for part-time work as soon as my younger son begins full-time school. I suppose I could be counted as one of the lucky ones as my husband is supporting me and my writing, whilst I am not working! 2. Do you plan to earn your living through your writing eventually? What are your goals? Yes, I hope so but that could be a while yet as I am quite a new author and thus have written one book so far. My goals is to have a few novels completed in the next five years. I can't see ahead of that yet, but hopefully to write, write and write! My determination and interacting with fellow writers, bloggers and other artists motivates me to write. 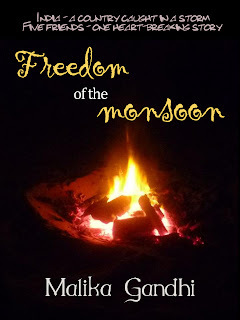 When I first wrote my first book Freedom of the Monsoon, my motivation was to see it published. When POD (Publishing on Demand) came into existence, it made that possible! Complusion or joy to write? A bit of both, I suppose. I know I can't go a day without writing a sentence or something but I also find it very enjoyable as well. 4. What are the issues you like to tackle? Tell me about ‘Freedom of the Monsoon’. I like writing stories with a moral attached but that is not necessary. I suppose I don't really have issues that I would like to tackle as such, just, what the characters dictate as I go along. Freedom of th Monsoon is about Indian Independence and we see the Quit India Movement and it's effects from a different angle. A lot of books are told from a political point which I wanted to avoid. Although there is a mention of the Movement and the leaders in the background, the book focuses on the characters - Rakesh, Dev, Pooja, Amit and Sunil (five boys and one girl - Pooja) who are caught up in the events during the Movement and which affect their life in one way or another. There is a lot of emotion in the book and a lot of Indian words, which I thought was important as without the Indian language, some of the scenes and emotions would not work ( I have detailed footnotes and a dictionary for the benefit of non-indian readers). 5. Are your stories autobiographical in anyway? In this case, not in the slightest. All the characters are fictional. 6. Do you have a disciplined approach to writing time allocation? My writing is only done during the night, when eveyone is alseep and there is a guarantee of no distractions or noises. That's the only time I can actually write. 7. How many books/short stories have you written so far? Is there a united theme to your work? Freedom of the Monsoon is my debut novel and I am currently writing a second, which is a contination. There is not a united theme but I guess you can label it as not light reading. 8. How important is research to you? Research is very important if you want to write something believable and this is true for every genre. As my books are based on history, research of the right facts is doubly important. 9. Was there one life changing moment that drew into the writing life or is it something you have always done? Not that I can think of...writing was something I have always done, be it writing diaries or short stories when I was very young. I used to write book reviews (which was part of my junior school work) and I enjoyed it very much. 10. What’s in the pipeline? Have you a story you are working on? Any new ideas after that? My readers can look forward to the second novel, which is a continuation of Freedom of the Monsoon, but which has an unexpected twist. The story will be told during two time sets - 1947 and 2012. Anjali is from 1947 and Arianna is from 2012 and the two lives are connected with a surprise. A third book thereafter and many more! THANK YOU SO MUCH MALIKA FOR SHARING YOUR THOUGHTS WITH ME TODAY. GOOD LUCK WITH THE FREEDOM OF THE MONSOON AND ALL YOUR FUTURE WORK. Malika Gandhi lives with her husband and two sons in the East Midlands, UK. She is a homemaker and in between caring for her family, she writes her books and dabbles in a little painting too. She loves to experiment with different mediums, such as oils, acrylic and watercolour. Malika was born in India but moved to London when she was two, where her father was already settled. She travelled with her mother and brother. Malika has lived in London, studied in Southampton and moved to Leicester after her marriage, which is where her husband and his family live. A girl moves in with her in-laws after marriage, at least for a short time. Malika loves to watch movies, visits art and history museums and is curious about the universe. Deleted? Grrr. I was *trying* to say that I will be looking forward to the next instalment of Freedom of the Monsoon. thanks Louise - wasn't me trying to delete you! Your comments are very welcome. And good luck to Malika for some sales.